This custom 10,000 square foot poured-in-place concrete skate park features a 6 and 9-foot bowl along with a variety of street and transition skate features like rails, stairs and grind blocks for street ridging. Designed by SITE Design Group, one of the nation’s premier skate park designers, this facility will provide challenges for beginners and advanced skaters alike. The Skate Park is open daily until dusk. Water Playgrounds are a great place to enjoy the hot summer days. 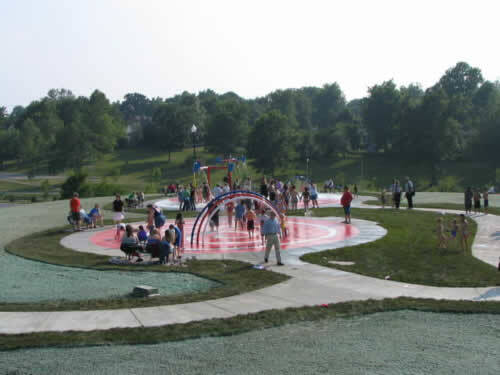 Our playgrounds are on concrete pads with spray features that shoot, spray or mist water for kids to enjoy. They are open daily from Memorial Day weekend through Labor Day. Our spraygrounds are closed in the case of inclement weather and every Monday morning for preventative maintenance (they will be closed on Tuesday mornings when Mondays are a holiday). For questions or more information please contact us at (816) 325-7370.